Check out Jazz Age Social Sunday 2018, Presented by The Art Deco Society of Dallas & Heritage Village Dallas on 03/24/2019. This is the largest vintage inspired event in Dallas. Wear your Jazz Age Attire or find what you need at Dallas Vintage Shop. We have true Vintage and reproductions to fit modern society and all the accessories you will need. You will find Quality, Quantity & Variety in complete outfits for ladies, gentlemen and children. Get entire wardrobes or just the period pieces you need, We have an entire Art Deco inspired jewelry section that is just one example of the choices you have at our shop, open all year round. Don’t forget to visit our Calendar of Costume Events for the DFW Area. You’ve just gotta go to the Dallas Heritage Park, Jazz Age Sunday Social on 03/24/2019. Don’t forger to wear your 20s Jazz Age Attire. If you need anything Jazz age, come to Dallas Vintage Shop, We have the most extensive collection of Jazz Era Attire and accessories anywhere including wigs, jewelry, gloves, seamed stockings, makeup, hats for men and women and tons of extras that will blow you away. Get jazzed Up at Dallas Vintage Shop. You’ll never, in this world, find more 20s Era, Jazz Age, Prohibition, Harlem Renaissance Clothing & Accessories in one place for Ladies, Gentlemen & Children. It is crazy. We have many thousands of complete ensembles or you can come in to find the one hat or accessory that will define your look. If you plan to attend the DFW Jazz Age Sunday Social 3rd Annual Jazz Attire & Music Event then Dallas Vintage Shop is a must when it comes to all the Ladies, Gentlemen & Children Attire for the Jazz Era. You won’t believe the quality, quantity & diversity in 1920s fashions and accessories. See you 03/24/2019 at Heritage Village Dallas. wear your 1920s Attire. You must attend this Vintage Attire Inspired DFW Event: It’s the 5th Annual Jazz Age Sunday Social, 03/24/2019, Heritage Village Park Dallas,=. Get all your Jazz Era Attire at Dallas Vintage Shop. From Day Wear & Casual Attire to Prohibition Gala & Opulent Socialites 1920s Clothing, we have everything you need from complete outfits to just the emphasis pieces you need. Get that just right 20s Jazz Age look you want. Now your are ready for the 6th Annual 2018 Jazz Age Sunday Social on 03/24/2019. You are invited to wear Jazz Age Attire for this fun Vintage Inspired Jazz Event at Heritage Village Dallas. 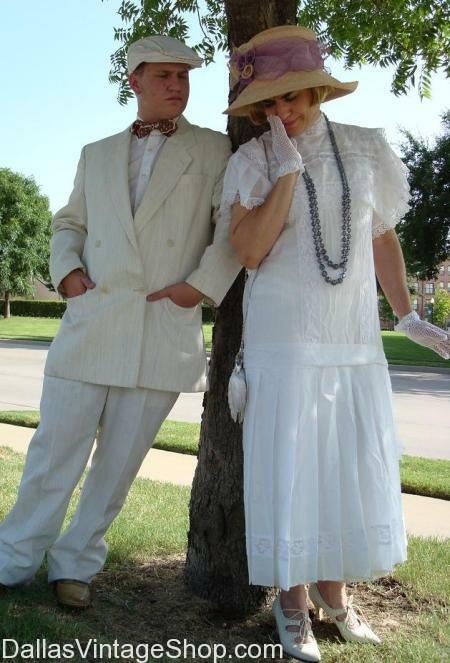 For a blast from the 1920s past come to the Jazz Age Sunday Social, 03/24/2019, Dallas Heritage Village. If you need Vintage Jazz Age Attire or Jazz age inspired clothing we have outfits from head to toe. Hats, Wigs, Shoes, Dresses, Suits, Gloves, Jewelry and all other period correct accessories you can think of are waiting for you here at Dallas Vintage Shop. ANNOUNCING: 6th ANNUAL Jazz Age Social Sunday: 03/24/2019, Dallas Heritage Village: COSTUME CONTEST: Wear Your Sunday Best Jazz Attire. ANNOUNCING: The 6th ANNUAL Jazz Age Social Sunday: 03/24/2019, Dallas Heritage Village: COSTUME CONTEST: Wear Your Sunday Best Jazz Attire. If you need Jazz Age Attire don’t worry. We have Vintage Clothing and Period Attire for men, ladies and children. All Sizes, formal or casual. Head to toe. Come see for yourself. Call us if you have questions. Posted in 2019 03/24 6th Annual Dallas Jazz Age Social Sunday | Comments Off on ANNOUNCING: 6th ANNUAL Jazz Age Social Sunday: 03/24/2019, Dallas Heritage Village: COSTUME CONTEST: Wear Your Sunday Best Jazz Attire. Need Period Clothing or Costume Ideas for the Jazz Era? The sky is the limit when it come to creative costume ideas. We have complete outfits or just the right pieces to fit your budget and complete your ensemble. Don’t forget the 2019 Jazz Era Sunday Social at Heritage Park Village in Dallas on 03/24/2019. It’s a costume event that you are invited to attend. You are in 2019 03/24 6th Annual Dallas Jazz Age Social Sunday category.